Dale Chihuly is an amazing glass artist! Glass blowing is mesmerizing to watch and takes such an incredible amount of skill to create! I have SO much respect for this medium! This project was inspired by MaryMaking: Dale Chihuly Inspired Sculpture. 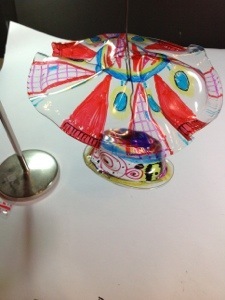 Her art class used Shrinky Dink paper to create the glass look-genius! I wanted to create a hanging mobile so my after school art class used CLEAR Solo cups and bowls to create our mobile, the children LOVED to watch the plastic warp and distort before their eyes! Learn about Dale Chihuly – Biography from his website. What does his artwork remind you of? Is glass blowing a single person art medium or do you need more than one person to create glass works? How do you feel about sharing the creative process with another person? What colors work best with glass blowing? Use permanent markers to draw designs & patterns on bowls & cups ( it’s best to tell the kids to limit the number of colors they use to 3-4 & just reuse these colors). You can also use Shrinky Dink paper cut into strips, then wrap them around dowel rods for spirals! 2. Cut one of the cups vertically about every 1 inch. 5. Use colored wire or string to assemble sculpture. If you choose to re-blog or use this lesson in any way (written or photos), then please make sure to link/credit to Create Art with ME.